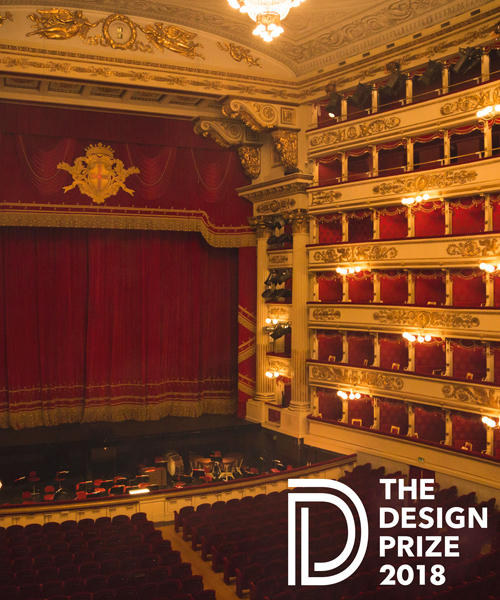 on april 17, 2018, during milan design week, the magnificent ‘teatro alla scala’ played host to hundreds of creative forces across the fields of architecture, art and design that came together to celebrate the second edition of THE DESIGN PRIZE. the star-studded gala ceremony drew the presence of tremendous industry figures — including doriana fuksas of fuksas architects, stefano boeri, ma yansong of MAD architects, maria cristina didero, carlo ratti, and many more — in awarding the extraordinary achievements that took shape over the past 12 months. founded by designboom and abitare magazine, THE DESIGN PRIZE is energised by edison and produced by PRY, and honors the categories of: lifetime achievement; best designer; exhibition; social impact; communication; design curator and design critic; the artistic realm; experimentation; distribution; and best design newcomer. beneath the opulent ornamentation of a dazzling and dramatic chandelier, the 2018 winners of milan’s official award program were gifted the golden madonnina statuette, this year designed by antonio aricò. against the backdrop of an enchantingly empty teatro alla scala, the winners then shared their insight about how ‘energy’ is defined in the context of their life and work, what drives their creative process, and how the city of milan has significantly shaped the design industry over the course of history. discover the thoughts of THE DESIGN PRIZE stars in the video interviews below and see our full reportage of the event here. ‘milan is the capital of the world — the design world! — because milan is one of the only cities in the world that has a design industry,’ india mahdavi says of the city. ‘energy is finding the right people and the right moment to do a risky project!’ describes astrid welter, head of programing at fondazione prada. edison is taking part in the 16th international architecture exhibition of la biennale di venezia by initiating a path towards sustainability and the efficient use of resources. the collaboration between edison and la biennale is based on awareness that energy is one of the fundamental elements of architecture and of the places, spaces and cities of contemporary life. edison — committed to building a future in which energy is sustainable — is currently working on the design and development of innovative solutions for the sustainable management of energy, environmental and economic resources. in collaboration with architects, companies, the service sector and the public service, the company is also co-developing the smart cities of today and the future. for the 16th international architecture exhibition, edison will provide la biennale with a ‘smart audit’ solution, which optimally manages energy resources thanks to the IoT and proposes improvement interventions for the main exhibition structures with the most energy intensity and impact. also, edison will provide visitors to the exhibition with free power recharging stations and wifi hotspots where they can stop and get full of energy.